We attended a very nice, small celebration of our countries founding last night. I have attended almost all of the Cedar Rapids Freedom festival fireworks.since it's inception nearly 30 years ago. Renee and I were busy yesterday watching a parade in the morning with family, and doing some outside work that needed to be completed in the afternoon/evening. We ended up with a late supper which put us too late to head to Cedar Rapids. Instead, we drove over to Lake Macbride State Park, found us a spot on the beach near another Canon photographer, and sat down to watch and photograph the fireworks over the lake. It was a very nice show and appreciative crowd. Instead of tens of thousands of people we had several hundred scattered around to watch a nearly thirty minute fireworks show sponsored by Cottage Reserve. In all, I missed the music with the fireworks, but not the crowds. The image below was taken about 1/3 of the way into the show. f/11, 28mm, ISO 400 for 4.4 seconds. As many of you know, I have been volunteering for Linn County Conservation and at Wickiup for at least 15 years. From doing some photography for them to serving as a host at Wickiup on weekends. I discovered this special place a few months after moving to Linn county from Iowa City nearly forty years ago. I am sure that I have hiked all of the property, from the north woods end to the south pond, from the east prairie to the Cedar River greenbelt. Getting to know the conservation staff, especially at the volunteer appreciation dinners, has been a lot of fun. Last weekend, I had the morning shift Saturday, from 10-1pm. I arrived early, wanting to hike around before my shift. I took the boardwalk into the central pond area. Everywhere I looked there were dragonflies. When my shift ended, I grabbed my Canon 5D Mark IV, 100-400 lens and tripod and sat down on the walkway, waiting and hoping that a dragonfly would land nearby. After about 10 minutes, several dragonflies started to land about 10 feet from my position. I waited quietly, not moving hoping that one of them would come even closer, finally, one did (see image below). With their four wings that can function independently of each other, you need to practice waiting patiently for the right moment. To stop the action, the image was taken at 1/200 at f/16 ISO400. There are more than 5,000 known species of dragonflies, all of which (along with damselflies) belong to the order Odonata, which means “toothed one” in Greek and refers to the dragonfly's serrated teeth. I went out a few days ago, cruising around Eastern Iowa, looking for farm scenes, a change from my usual wildflowers, animals, birds and grandkid photography. The clouds were building, looking like a storm was likely, but unfortunately, never materialized. I visited several counties and on the way back towards Lake Macbride, I came saw this beautiful farm. I always try to pre-visualize, see link below, as taught by Ansel Adams, what my final image would look like. But on this day, I didn't have a clue as to how I wanted to display it. The next weekend, I ran across some work by a Minnesota photographer, Douglas Cummelin. He inserted one of his sunset images into a outline of Minnesota on a brochure promoting his work. I thought I would try it. This is my first attempt to show the beauty of Iowa, one of the fly over states. Your comments are always welcomed. Below are a few quotes about Memorial Day. I hope everyone understands and appreciates the sacrifices that our solders gave to protect our country. Often today, I am not sure that others realize how great our country is. I have always been disappointed with the video capabilities on my 5D Mark II camera. It would randomly hang and not save the video that was being recorded. I was forced to turn off the camera each time it occurred. Unfortunately, Canon was aware of this issue as it happened on so few of cameras that they were never able to correct it. I recently purchased the Canon EOS 5D Mark IV camera and had a chance to test the video features a few nights ago at my granddaughter's spring concert. I took several Full high-Definition (Full HD) videos of their performance, Everyone was very pleased with the outcome. This evening I decided to look into a feature of the EOS Movie Utility where you can generate a still image from a video file. The still image specs were 8bit, 1.12MB, 1920x1080 with a resolution of 72ppi. The image below is a 1/4 crop from the actual image capture. An image that you certainly can post on social media or a personal website. Good Job Canon! The other day, Renee and I went out on a road trip to enjoy a beautiful display of bluebells in NE Iowa. The wet spring weather seems to have brought out more bluebells than last year. After lunch and a drive in the country, we stopped near an eagle's nest I had spotted last year. I was not sure if it was still active or not. As we slowly approached, Renee spotted movement in the nest that was still over 100 yards away. I grabbed my Canon 80D with a Canon 100-400 lens. Up in the nest, maybe 75' off the ground, was a watchful parent and an eaglet. The other parent was just off to the side, on the same branch. Both parents were watching us, just as we were watching them. Shortly after we arrived, the other parent flew off in search of food for the eaglet that was "testing" its voice. It was just an amazing day. I had a great night last night. Walked to the lake about 45 minutes before sunset, sat down on a dock, stayed very still and waited for the pelicans to come back in searching for dinner. After about 10 minutes, they started to float up, between the two docks. It took that long for them to accept the new object, me, was no longer moving and was not a threat. The pelicans came within 25 feet of where I was sitting, until they sensed something, they turned and floated about 10 feet away, only to return, over and over. It must have been good hunting, as more and more pelicans came up, between the two docks too feed. I fired off images at 7 frames per second, trying to capture the entire pelicans hunting/eating motions until nearly sunset. After dinner, I browsed thru the images, only to stop, and laugh at this one image (see below). I immediately saw the humor. Can you imagine what we humans would be thinking, if we were looking down, into a large orange opening, knowing that we were suddenly dinner. I had never created a "talk bubble" before in Photoshop, it turns out to be very easy. 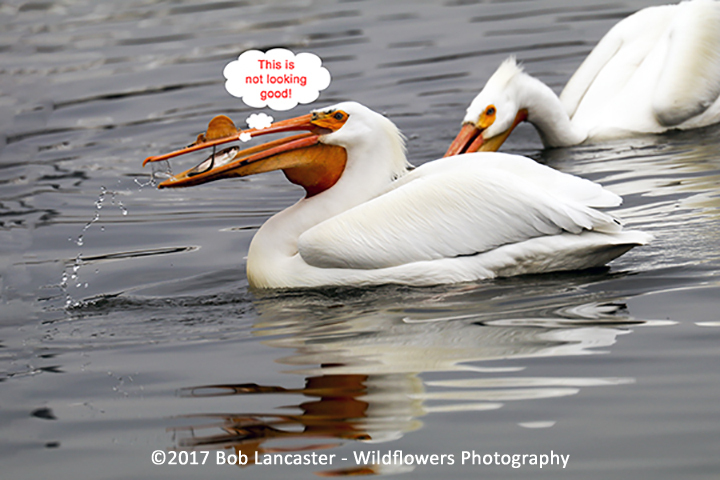 I have been walking around Lake Macbride for over a month watching and photographing the American White Pelicans during their migration to Canada. Yesterday, a friend called me saying some boys were throwing out some dead/floating shad from a eddy near the bank into the water. He watched as the pelicans started to approach the shore. Normally, they are very shy, but with free food, their shyness disappeared. Unfortunately, I did not get there in time to see this hungry flock, estimated at over 100 pelicans, with their beaks opened, and their bill pouches extended, trying to catch the flying shad. When I did arrive, just before sunset began, the water in the wind protected cove was nearly smooth. I caught this long reflection as the pelican prepared to land, dropped his bright orange web shaped feet down, like a water skier. Yesterday morning, I and six others, were in a photographers only bird blind, on the south bank of the Platte River, at the Rowe Sanctuary, near Kearney NE. In the two hours we were in the blind, thousands of images were recorded. This pair of cranes were approximately fifty feet away. As the sun peaked out of the clouds , some of the cranes, like this one, looked east and paused. The photographers all smiled and it sounded like popcorn popping, as all of us started taking images. All photographers have the desire to be in the right place at the right time for the "perfect" light. Yesterday, I was privileged to be present. As I go thru the images, I will add a folder to this website of crane images. Please feel free to share and comment. I was out shooting early this afternoon, and came across this Mallard enjoying today's warm weather and a little swim. I have rented (from BorrowLenses.com) a Canon Extender EF 1.4x iii for a upcoming road trip and thought I better test it out ahead of time. Using the extender with a Canon 80D, 100-400 ii lens, tripod, shutter release, at f/8.0 and 560mm, the images were unfortunately not as sharp as I require. I tested this combination on some blackbirds, pelicans, woodpeckers and cardinals with the same obvious softness. However, backing off to approximately 500mm, the sharpness improved as seen in the image below. At 480mm, the sharpness was equal to the 100-400 lens alone. Hopefully, the extra 100mm achieved by this extender, over my 100-400 lens will be sufficient for the upcoming road trip. I will lock my 100-400 with the extender at 500mm and hope for the best. Monday. Spring Break. At least 5" of fresh snow on the ground. What can I say. It was a Monday. A beautiful snow storm last night that started about 7pm, with about 3" on the ground when we went to bed. At 7 this morning, at least 5" had fallen, and it was still snowing. I put on my cold weather gear, charged the batteries for my cameras. and headed to the bird blind at U of I Field Campus. I followed the snow plow on its second pass into the park and found a cleared parking spot. After a brief hike, where I was certainly the first person at the blind today. I setup my equipment and waited for the birds to return (typically, walking to and entering the blind will cause the birds to depart for a few minutes). The photography was great, six of seven different species were feeding. I counted at least ten pairs of cardinals searching for food. The pair below was comical as both of them would feed, than the female would sound off, making an almost a whistle-like sound, and the male would immediately take off, only to return about 90 seconds later. The female stayed at the feeder, for nearly 30 minutes, enjoying the meal. I would have to admit, photographing cardinals in a fresh snow is breathtakingly beautiful. OMG! I'm out of here! Apparently, I am not the only one who has bad hair days. American White Pelican at Lake Macbride. Johnson County, Canon 80D, 100-400 series II lens, f/5.6, 1/1600 sec, ISO 400, handheld on a very windy afternoon. I was in CO for several days last week, visiting some good friends while photographing in and around RMNP. It truly is a completely different place in the winter. The ranger at the entrance said I was only the 55th person to enter the first afternoon I was in the area. I remember that last years total attendance was 4.5 million, a new record. I drove around, taking some images of the elk and lots of snow capped mountains.. When my time in the area was up, I headed towards Kearney NE, with a goal of checking out my next photography adventure. In a few weeks, I and 9 other photographers will be in a bird blind, photographing the morning waking-up of an estimated 650,000 Sandhill cranes. I spotted the whirling flight of the cranes from the interstate, and turned south to see if I could find them. It was a beautiful early Spring day, and I had a window rolled down. Suddenly, I heard this unfamiliar sound, I knew I was close, as I had just crossed the Platte river. Off to my left was a frenzy of activity; cranes preening, flying in, flying out, singing, dancing, yes dancing. The male jumps up with his wings out, calling a loud rattling "kar-r-r-r- o-o-o" sound in a pre-mating ritual by unpaired cranes. The image below was one of a dozen images of a crane(s) who either took off or were landing near me. One of the unforgettable lines in Poltergeist "They're ba-ack" came to mind this morning as I was walking the Solon to Lake Macbride trail. The American White Pelican has returned for a stopover in Iowa on their way to their breeding grounds in Canada (see chart below). I wonder how long they will be here? This is the earliest I have seen them on the lake and per a local DNR conservationist, it is also the earliest they have seen them. They usually arrive in late March or early April. The image below is one where the sea gulls and the pelicans are standing on the shallow rocks surrounding a fishing island on the north side of the lake. As soon as the pelicans stopped swimming, the preening begins. I plan on heading out near sunset to see if I can catch them doing their unique feeding ritual where, in a group they cooperate and corral fish to one another. Here we have yet another sign that Spring is coming to Iowa. I got out into the woods near the Coralville Reservoir this morning with the intent of getting my daily 10,000 steps in early. The calm wind, sunny skies and above normal warm temperatures for February, made it a great walk. When I came to an opening in the woods, I looked up and saw several eagles, both mature and immature ones, riding the rising thermals. I flashed back to the promises of the 1960's, that we would have flying cars by now, as I so wanted to float like the eagles. The bright sun glowing thru the tail feathers of the eagles caught my eye. I laid down on my back, pointing my camera to the sky and waiting patiently for a mature eagle to fly above me. The image below is one of a few I was able to get. The semi-transparency visible in the tail feathers was just beautiful. I still wish we had flying cars. I should have carried a tripod. The image (below), of a raindrop hanging from a branch, was taken early in the morning, hand held without a macro lens. I always carry a camera with me when hiking, I just didn't expect to need both a tripod and a macro lens. This morning, the woods was damp with many of the undisturbed branches loaded with water drops hanging down ready to fall. I was nearly done with my walk when I spotted this large drop. I stopped, relaxed, controlled my breathing, adjusted the camera settings, focused as close as possible using my Canon 5D and 24-105mm lens, and fired off a couple of shots. I felt a slight breeze and suddenly, the raindrop was gone. Perhaps I would have had time to setup a tripod and switch to a macro len (had I had them with me), but most likely there was not enough time. Again, I continue to tell everyone, get out and enjoy nature, and especially, the simple beauty that can be found from a walk in an Iowa woods. If you have not made it to a bird blind, I suggest you do it during the winter as the birds are hungry and not quite as camera shy. This red-headed woodpecker was definitely trying to control one of the feeders. If another bird approached the feeder, this one would sound a raucous "kwrrk" and force the other bird to flee. In the area, there are two public bird blinds, on at Wickiup Hill Learning Center, Linn county and the U of Iowa Macbride Field Campus north of North Liberty. Both have their unique features and "clients". This morning, after the overnight snow, I headed to the bird blind at the U of Iowa Field Campus with the hope of catching a few cardinals on the evergreens and in the fresh snow. It was a mere 20° F with a 10 mph wind in my face inside the blind. There were a few squirrels, lots of deer and juncos when I arrived. After about ten minutes the female cardinals started appearing, followed a few minutes later by the male cardinals. All told, there were at least fifteen pairs of cardinals feeding. The image below was one of the few where the female and male cardinals were in the same area. As the morning progress, the feeders got busier and busier. Before the Superbowl started, before the endless snacking, before the commercials, I decided to go for a walk at the University of Iowa Macbride Field Campus. The parking lots were nearly full with several large groups of families and lots of excited dogs out enjoying the warmer weather and plentiful sunshine. The noise from these park visitors had a profound effect on the wildlife who were also trying to enjoy the warmer weather. I always hike with a camera, or two, either both in my backpack or sometimes one on my shoulder. Yesterday was no exception. 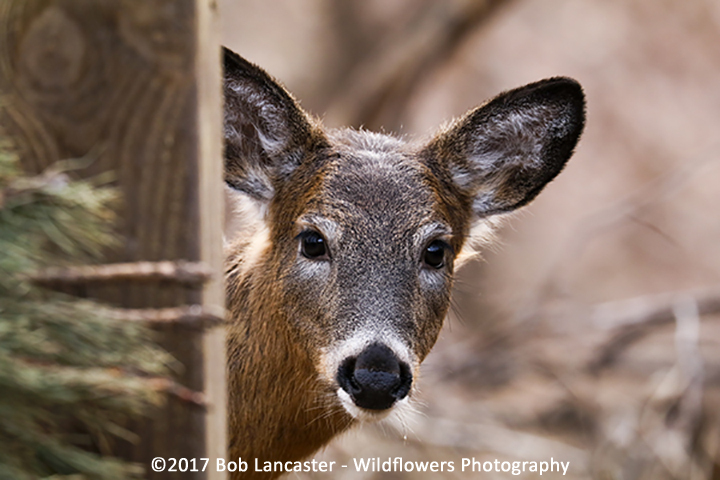 On a trail, out as far as I could get from the parking lot, I saw ten white-tailed deer slowly coming up from the edge of the lake back into the forest. I enjoyed watching the young ones playing around, than running to catch up with the adults. As I continued my hike, I headed towards the bird blind, hoping to photograph the large bluejays that randomly appear. I was surprised to fine myself as the only one at the bird blind, in fact, for about fifteen minutes, there were no other creatures there either. Too much noise from the large families walking behind the bird blind. As the quiet returned, so did the creatures. First, a family of squirrels, some posing (see below), looking for what was causing the noise, as I took their picture. This was soon followed by two red-headed woodpeckers who appeared to be flying in formation, bombing all the other birds out of the feeding area. This occurred several times and afterwards, the woodpeckers landed in a nearby tree and chirped loudly for the next thirty minutes. Amazing. It was getting near sunset when I heard, and finally saw the ten deer slowing working their way up, into the feeding area. The smallest one, seemed reluctant to enter. He did peek out and pose long enough for me to get off a couple of images (see below). As I walked out towards the now empty parking lot, I again realized what a beautiful place we live, Iowa. My office window looks west, so if I am working at my desk, I like to keep a watchful eye out for the possibility of a colorful sunset. Last night with the thin low clouds and somewhat strong wind, there was that potential. So with the oven warming up for dinner, I went down to a favorite spot of mine on the north edge of Lake Macbride with the idea to catch the sunset off the ice covered lake. To my surprise, there was lots of open water both near the shore and out towards the center of the lake. I watched and photographed a beautiful sunset. It was a very peaceful experience, as there wasn't another person anywhere watching this winter sunset. I hope there will be another one as beautiful as this one soon.